One of the key functions of the Children module is to make it intuitive to set up and manage your church's children's (and youth) groups. Central to this is the ability to add/move children and young people to the groups that you create, which is why ChurchSuite includes several different methods to make assigning children to the right group as quick and easy as possible, and in the places where your existing workflows need this to happen. In this article we'll explain each place in turn. We'll also see how to process children through your groups as they get older. When you are editing a child's contact record in the Children module, along with their other details (i.e. name, address, mobile number, etc) you are also able to set which Group that child is a part of for each of your Gatherings. Remember, you may have multiple Gatherings - perhaps one for your weekend service group structure and another for your mid-week groups. A child can be assigned to one group in each Gathering. To use this method, begin by going to the child's contact page and clicking "Edit child". Simply use the drop-down menu(s) to select which Group within each Gathering that the child is a part of. Selecting "Auto-assign group" will now add the child to the correct Group in that Gathering based on their DOB and the Group entry criteria when the child record is saved. A valid DOB is required. Attempting to auto-assign a child to a Group without a DOB will result in a warning message advising you that you must select the group manually. Please note that "Auto-assign group" is not a retained setting after the child contact is saved, and neither does it automatically process a child to new groups as they get older - it simply serves as an easy way to auto-add a child to an eligible group at the time the child contact record is saved, saving you needing to know which eligible group to add them to. Processing children to new groups as they get older is never an automatic process in ChurchSuite (there are always exceptions! ), however we've made the ability to process children into their new groups really quick and intuitive - see later in this article for details. Once you're happy with your selection, simply click Save Changes. You can also add children to a Group in the "Edit group" page. From "Children" > "Groups", select a Group from the list and click "Edit group". Scroll down to the Children section. Here you can search by child name or tag and select children to be added to the group. The list of children filters as you type. Typing "tag:" will filter the list to children tags. Selected children are added to the box on the right. Selecting the 'x' next to a children name on the right will remove them from the group. Once you've finished adding children to the Group, click "Save Changes". 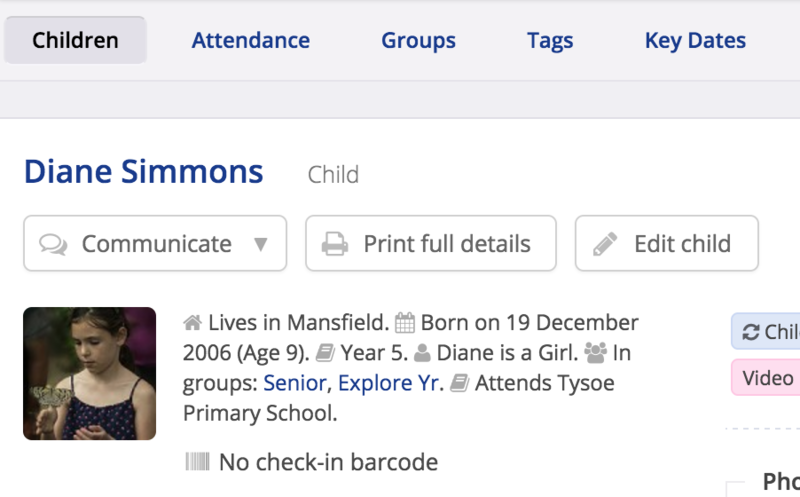 The "Not in Gathering" report in the Children module reports is a really quick and useful way of identifying children contacts in your database that have yet to be assigned to a Group in a Gathering. Go to Children > Reports and select the "Not in Gathering" report in the Data Cleansing section. Select a Gathering from the drop-down list in the blue report filter section and click 'Generate' to apply the filter. The report creates a list of all your active children module contacts that are not currently assigned to any Groups within the selected Gathering. By clicking on the "+Add to..." button next to each child, you can automatically assign them to the suggested Group. The suggested Group is based on the child's DOB and the entry criteria set up for your Groups. This method is really quick, and saves you having to edit each child contact's profile in turn. 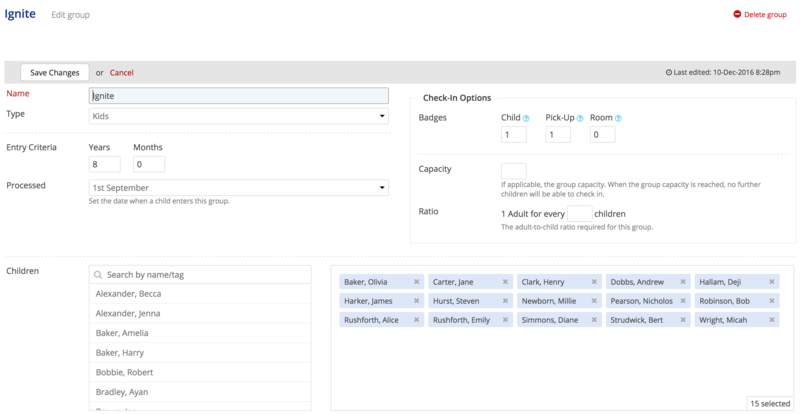 Overview: Children groups include a "Process group" feature - which sorts through the children already assigned in a Group, and compares each child's age/DOB details with the entry requirements of all your other children's Groups in the same Gathering. The system then suggests the appropriate Group to assign the child to based on the DOB/entry criteria with a button to assign them to that suggested group, or override and select a different group. Again, this method is really quick and saves you having to edit each child in turn. Note: Children are not auto-processed as they get older - instead churches will use the "Process Group" functionality to process children when they choose to. So if your children move groups at the start of September, we would suggest children be processed in late August. For groups where children change groups on their actual birthday it will be necessary to process groups more frequently - perhaps each month. To use the Process Group feature, go to "Children" > "Groups". For any given Gathering click on each Group in turn and select the "Process group" button at the top of the group page. On the next screen you will have the opportunity to review the suggested Group that each child will be assigned to if you were to click save changes - children that have suggested changes are highlighted. You can of course override the suggested Group if you wish - for example, it may be that you feel it would be more appropriate for a child to move up a group early, or stay in a Group beyond the groups age criteria due to special needs or friendships. To do this, simply change the Group selected using the drop-down menu listed under New Group. Note that the report shows the Current Group and the suggested New Group. To process the New Group assignments, having reviewed all the suggested changes, simply click "Save Changes". Children are immediately processed into those new Groups. Repeat this for each Group in your Gathering, perhaps starting with your youngest age group and working methodically up through your older age groups. By using the "Change Date" button, you can view the report of eligible children group processes ahead of time. For example, during August, ahead of a new school term starting in September, you can click "Change Date" and view the report of eligible group processes as at the date you specify. This method allows you to easily complete your anticipated Group processing before a new term/year begins. Note that processing the group is still immediate.